Rope jumping makes bungee jumping look completely sane and kinda cute. There's no flex: The whole "not dying" part is determined entirely by where you anchor the rope—and where you jump. Leave it to the nation who contrived Russian Roulette to come up with rope jumping. It looks totally simple and straight forward, until you just think for a second about the physics involved. If you jump straight down, you could dislocate some important part of your body, or worse, you could snap the rope and keep on falling. The key is to jump so that you swing across the underside of the bridge, and to trust that your rope is attached to something that ain't going nowhere. And you'd better be coordinated when doing it in groups of, say, 54—like above—lest someone on their backswing hits you as you're heading down. 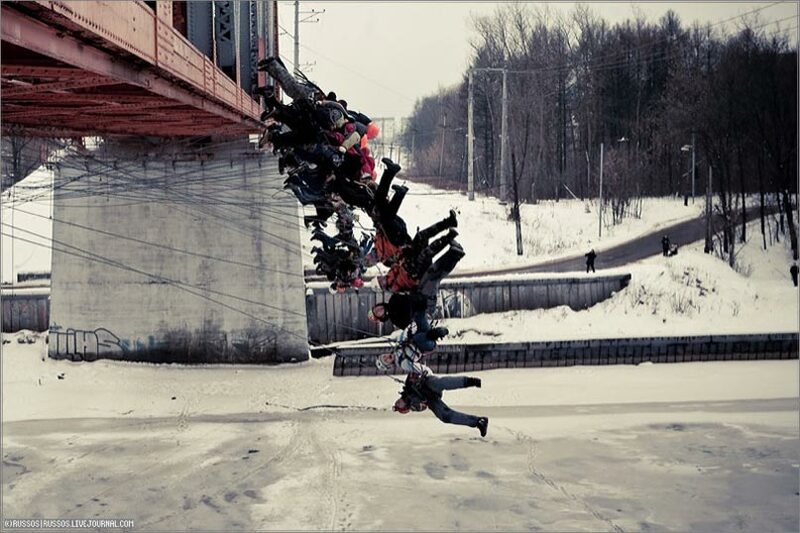 ...when there is no water under the bridge but raw firm ice, also they use to jump at that same moment when the train is going thru the bridge.